A point of reference is the tiny town of Gold Bridge, location N50.85165, W122.83865. We drove there from the town of Lillooet, one may also get there from Pemberton on Hwy. 99 located south of Gold Bridge. From Gold Bridge, take the Lillooet Pioneer Road going uphill (east). Fork left at location N50.82255, W122.82517, then continue to follow this pretty good dirt road all the way to the trailhead located at N50.71630, W122.65849, elevation about 1350 meter. Follow the pretty good trail (initially old road) that forks perpendicular away from the forest road. This trail soon bends right and becomes a narrow trail completely overgrown with branches from both sides, bad when wet. After this initial section, the trail climbs heading for the valley running in from near location N50.69896, W122.63228. 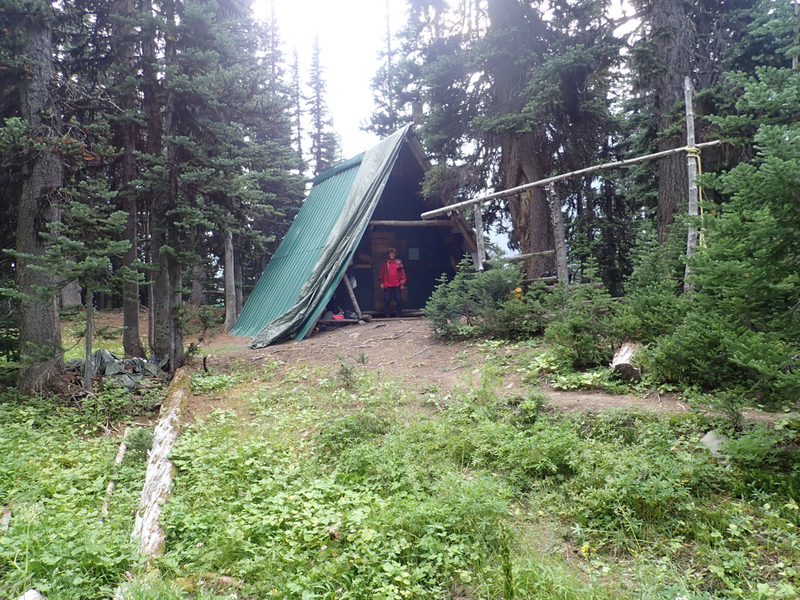 After a pretty boggy section, you will arrive at an old hut / building. From this point, one should find and follow the trail that runs up this valley staying at its right hand (south) side. 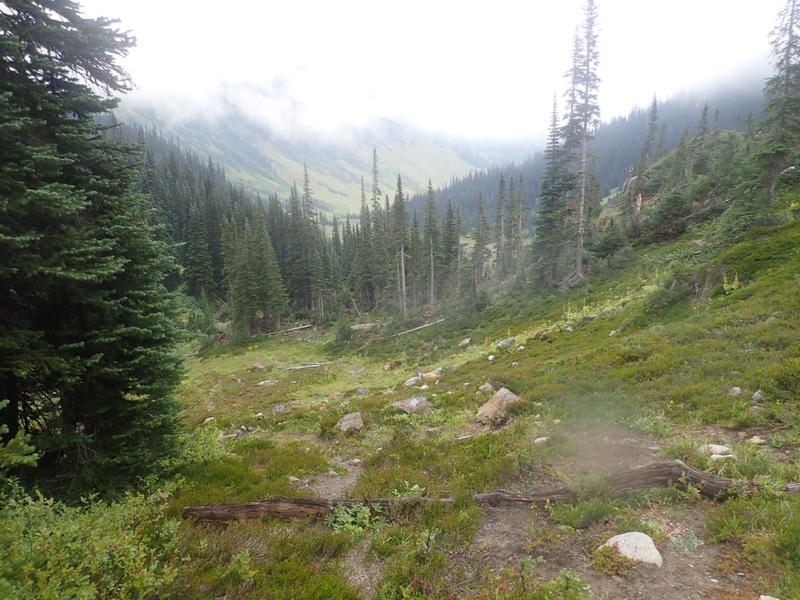 This trail is dry, pretty well marked and avoids more wet/boggy land in the center of the valley. Continue along this trail until you are essentially at the col (where the valley tops out), this is near location N50.68724, W122.59577, elevation close to 1870 meter. From this location, ascend more or less directly uphill on the north (left) side of the valley. The objective is to cross over and descend into the valley located across the crest (north-east). You will locate cairns near this crest (at approximately 2230 meter) and find a very clear and visible trail that descends on the left side (north) of the slopes towards the valley floor. Follow this trail down into the valley and further down into the lower part of this small valley. 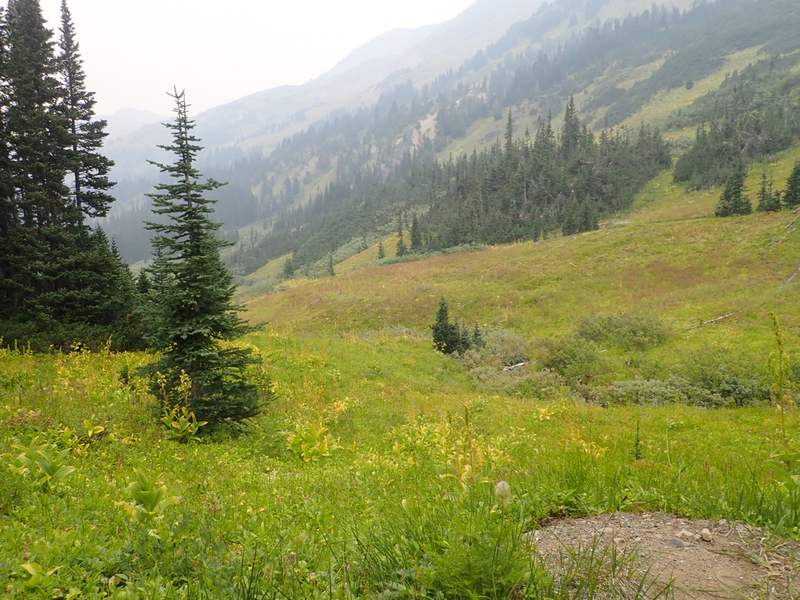 There is a hut / shelter located at N50.70216, W122.55390, elevation about 1830 meter. The shelter itself is not very attractive as a place to spend the night, but this location is quite well placed to serve as a campsite. 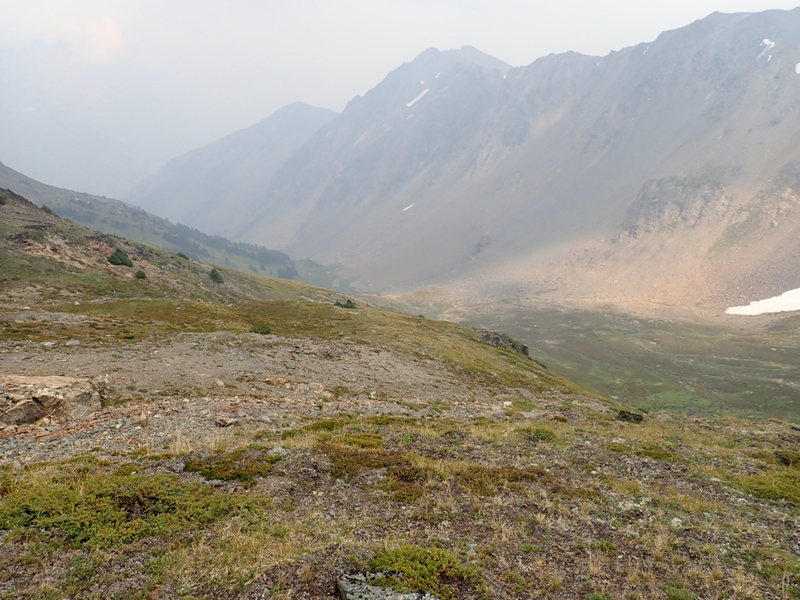 From the shelter, continue down to the valley floor just downstream, then cross to the opposite side and gradually traverse while ascending in order to cross a smaller valley somewhat higher then continue up steeper slopes on the lower part of Whitecap. There are some rather steepish grass slopes where care should be taken, in particular when wet. An ice axe may even be useful for extra safety. Higher up, the slope eases and becomes more rocky. Continue uphill, then gradually traverse a bit right while still ascending. Pick what appears to be the best route as you finally reach the main ridge/crest and follow this to the summit. After our adventure on Mount Seton, we stayed one more night in the local village, then drove across to the trailhead. The plan was to hike as far as the shelter this day, then do a full day with ascent and hike out on the following day. After a nice drive, we started out from the trailhead/car at 1145. Inconvenient with the wet bog and we were indeed very happy to discover the good, dry trail running up the valley along the right hand side. The route went ok, but it is a pretty long approach and it took us 5 hours to reach the shelter. This hut is not very attractive as a place to stay overnight, we established camp (with my mountain tent) outside. The next morning, we were off at 0700. The steep grass required care, one could in the worst case have a fall with difficulty to self arrest. 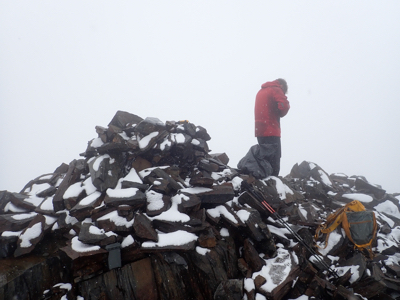 Higher up, the terrain became more hiker friendly, but the weather took a turn for the worse. Fog reduced the visibility and the temperature ran close to zero Centigrade. We arrived at the highest point at 1030, the place did not invite to a long stay, we headed dowm already at 1045. Back at the shelter by 1315. A longer rest was now well deserved, thus we continued our trek at 1430. Still a long way to go, we were both quite happy when reaching the car at 1825.